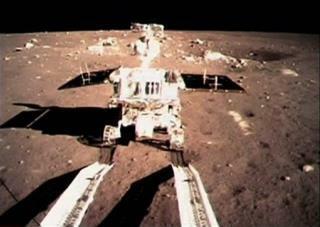 (Newser) – Zombie on the moon: China's Jade Rabbit lunar rover has shown signs of life despite earlier reports that it had died following mechanical difficulties in the extreme cold of the lunar night. The rover—which signed off with the ominous words "Goodnight humanity" at the end of January—is now sending out signals and Chinese state media say it has become "fully awake," reports the BBC. I've always preferred Andy Williams' version. I hope it doesn't run over the footprints left by our astronauts but I would like to see a pic of our flag. It supposedly blew over when the Lunar Module took off. Glad to hear it! Maybe it'll be their counterpart to the long-lived Spirit and Opportunity probes on Mars.